In case you do have multiple monitors connected to your windows computer whether it is a desktop or laptop, you can easily work on multiple monitors from your single keyboard and mouse. For Desktop Computers you might need an extra multi monitor graphics card and appropriate display devices such as monitor or projector etc. Once you fulfil the hardware requirements of connecting multiple monitors to your windows computer, you need to run your monitors in extended mode. 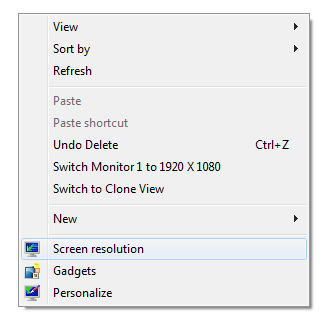 Right click on desktop and select Screen Resolution. This option will be available in Windows 7 and Windows 8 computers. 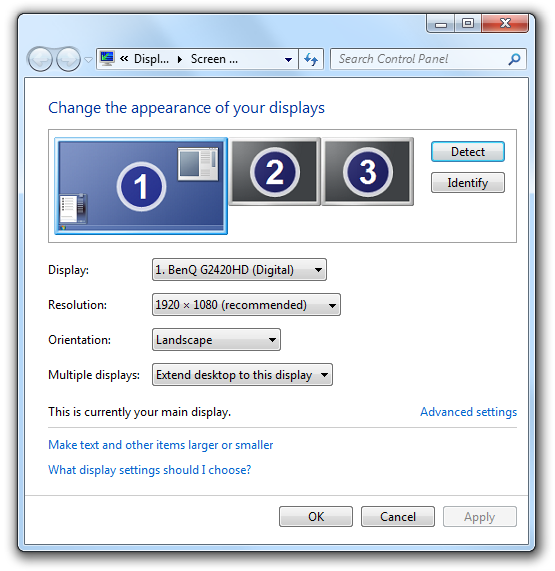 Clicking on the Screen Resolution will display a screen displaying available monitors to connect to as displayed below. In order to setup your monitors in extended mode, select the monitor which is displayed in black color and from the Multiple displays option, select the option which says Extend Desktop to this display. The option to extend the display will be visible only when you select a disabled monitor. You can also click on Identify button to see which monitor is which. The Detect button once clicked will allow you to detect any non-identified monitors or display devices. In case you would like to enable or disable second monitor multiple number of times, you can have a look at the Dual Monitor Software which provides desktop shortcut, system tray menu, shortcut keys, etc to switch to extended mode or back to single mode or even clone mode.